Obviously this is just a start - it uses an advanced bit of code I created as an enhancement from the module that plots the vessel tracking here on the mate. 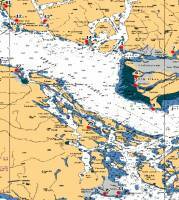 It has been enhanced to provide for base maps that cover less then the entire earth´s surface and can autmoatically select the map with the best scale that contains the point or points to be plotted from all those available. Put this all together and now SAR missions can have their Lat/Long selected by a click and all are then automatically plotted on a map for later analysis.